Ross Perot campaigning for President in 1992. Ross Perot (born 1930), entrepreneur, and independent presidential candidate in 1992 and 1996. 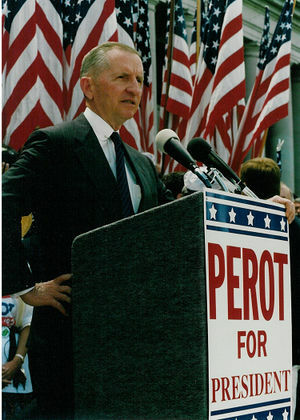 Perot became a major figure in the 1992 presidential election through his forceful personality, his crusading style against free trade agreements advocated by both major party candidates, federal deficits, and his articulation of many people's anger and frustration with job loss and the political system. His money brought him fame, credibility, and a large, well-paid staff. He became a billionaire as head of the computer company Electronic Data Systems, which held very large contracts with the federal government for processing Medicare and Medicaid claims. He sold it to General Motors for a vast sum and a seat on the GM board. GM could not handle such an unconventional outsider, and they bought him out for another large sum. By 1992 his portfolio of holdings added up into the billions, making him one of the two richest political figures of the era. Perot had for some years been involved in reform efforts in Texas. He helped modernize Texas's education system and its antidrug policies. He gained national fame for his much-publicized efforts in 1969 to free American prisoners of war held in North Vietnam. His successful effort to free two of his company's employees who were imprisoned in Iran in 1978 was the subject of a best-selling book, On Wings of Eagles, and of a television miniseries. Perot alarmed many Americans by darkly suggesting that the Reagan administration was not doing enough to help prisoners Perot believed were still being held in North Vietnam. That caused his break with Reagan and mainstream conservatives, and made him an enemy of Vice President George H. W. Bush. In the 1992 Presidential election he ran for President as an independent candidate and won 19% of the vote, which is the most any independent candidate has ever received. Everything about Perot's candidacy was unconventional. He launched it on a television talk show in February 1992, saying that if volunteers placed his name on the ballot in fifty states, he would run for President. But his campaign began well before the ballot work was finished, in mid September, and Perot himself put substantial funds into the work of his "volunteers." The crew-cut, plain-talking, can-do Perot captured people's imagination and frustrated independents, mostly conservatives who distrusted the Republican Party, rallied to his banner. He became the leader of a substantial movement. Perot's vast fortune clearly helped him reach the electorate, and gave him credibility as a man who understands finance, but without his ability to mobilize an army of dedicated supporters he would have cut a smaller figure. The candidate's name appeared on the ballot in all fifty states thanks to the dogged efforts of unpaid volunteer activists who heeded Perot's call for help on the "Larry King" show. Virtually overnight, thousands of citizens stepped forward in response to Perot's appeals to staff local campaign headquarters and circulate petitions. All of the accouterments of a national political campaign sprung up as billboards, buttons, and bumper stickers appeared, and political rallies were skillfully orchestrated. Perot developed what might have been the most effective campaign organization of the three general election candidates, even though his was brand new and even though—or perhaps because—it lacked the history and permanence of a major political party organization. In terms of issues Perot activists were decidedly in favor of term limits, suggesting a basic hostility toward professional politicians (like Bush and Clinton). Perot activists were more supportive of greater limits on foreign imports than the general public. Perot made headway with his vigorous opposition to NAFTA, warning against the "giant sucking sound" of jobs leaving America. The Perot activists were more supportive than others of a government-sponsored national health insurance plan. Likewise, they were less supportive of restrictions on abortion, and they were somewhat more likely to support affirmative action. Averaged over all the issues, the Perot activists were more liberal on some issues, and more conservative on others, but strongly agreed that politicians and the old parties were bad and the deficit was ruining America. Perot peaked in June, 1992, running even in the polls with incumbent President Bush and with Democrat Bill Clinton. Pundits speculated that Perot could carry enough electoral votes to keep either Clinton or Bush from accumulating a majority, thereby throwing the decision into the House of Representatives (where Democrats had a majority). Perot had money, momentum and voters, and appeared unstoppable. Then he stopped himself in the strangest twist in the history of presidential politics. Perot was personally ill-prepared. He knew little about the major issues of the day, and he was a poor campaigner who could not relate to the millions of his followers. He kept hidden behind an army of aides. On July 16, at the peak of his strength, Perot suddenly withdrew from the race, apparently because he could not take the psychological pressure. His admirers felt abandoned, as Clinton adroitly scooped up most of Perot's supporters. Perot's reentry into the race on October 1 was just as quirky as his withdrawal had been, but he made it clear that he did not want to be declared a quitter. His bought network time for thirty-minute infomercials that showed him pointing to various charts and graphs about deficits and economic indicators. Perot vehemently denounced deficits as evil and corrupt, but was unable to offer a plan to actually deal with them. Still, he forced the deficit issue onto the national agenda. He also crusaded against "revolving-door" lobbyists and lobbyists for foreign countries. Two weeks before the election, Perot began to climb in the polls again; his numbers reached 20%. But then more bizarre behavior puzzled Americans as to the state of his mental stability. On TV nine days before the election, and at a press conference the following day, he revealed for the first time an ugly side to his personality. He was deeply suspicious of hidden enemies all around him. He claimed that he had pulled out in July because he had been warned that the Bush campaign would try to disrupt his daughter's wedding. He spoke of a supposed attempt on his life in 1970 by some Black Panthers who, he said, had been sent by the North Vietnamese. On election day he won 19% and enabled Clinton to score a clean majority in the electoral college. The Perot voters were very similar in demographic profile to the overall electorate,with a somewhat smaller percent of minorities, those over 60, and those with postgraduate education. They differed from Bush and Clinton voters in their alienation from major institutions; they distrusted politics, business and the military. They were more pessimistic about the future, and were especially worried about the federal deficit. The 1992 election was unique for a number of reasons: a perception that economic conditions were worse than they actually were, which harmed incumbent President Bush; a strong third-party candidate in Perot; a backlash against 12 years of a conservative presidency that generated ever-larger deficits; and, perhaps most importantly, Bill Clinton's ability to unite not only the Democratic Party, but a number of heterogeneous coalitions, much as Franklin Roosevelt, also a consummate politician, did in the New Deal Coalition after 1932. In the 1996 Presidential election Perot ran again as the candidate of the newly founded Reform Party, which he created and funded. He won a mere 8% of the vote. His quick zinging wit that boosted his popularity in 1992, had largely evaporated or backfired by the campaign of 1996. Perot let it be known he was not pleased when Pat Buchanan got the Reform Party nomination in 2000, but there was nothing he could do about it. Follett, Ken. On Wings of Eagles. (1983). 445 pp. ; an account of a 1979 rescue mission to Iran to free abducted EDS executives taken hostage at the height of the Iranian revolution. Levin, Doron P. Irreconcilable Differences: Ross Perot versus General Motors. (1989). 357 pp. Pomper, Gerald, ed. The Election of 1992: Reports and Interpretations (1993). Perot, Ross. United We Stand: How We Can Take Back Our Country (1992). ↑ The other was Michael Bloomberg, currently mayor of New York City. Henry A. Wallace reached the billionaire status after he left politics. This page was last modified on 14 December 2016, at 17:10. This page has been accessed 23,975 times.